Picnicking is a very popular and historic activity at Fort Hill, and the park offers some of the most beautiful picnic grounds in the state. The grounds are shaded by tall trees and dissected with a small meandering stream. The handsome picnic shelter was built in the 1930’s by the Civilian Conservation Corps out of native rock and wormy chestnut. Grills are available at both the picnic shelter and picnic areas. 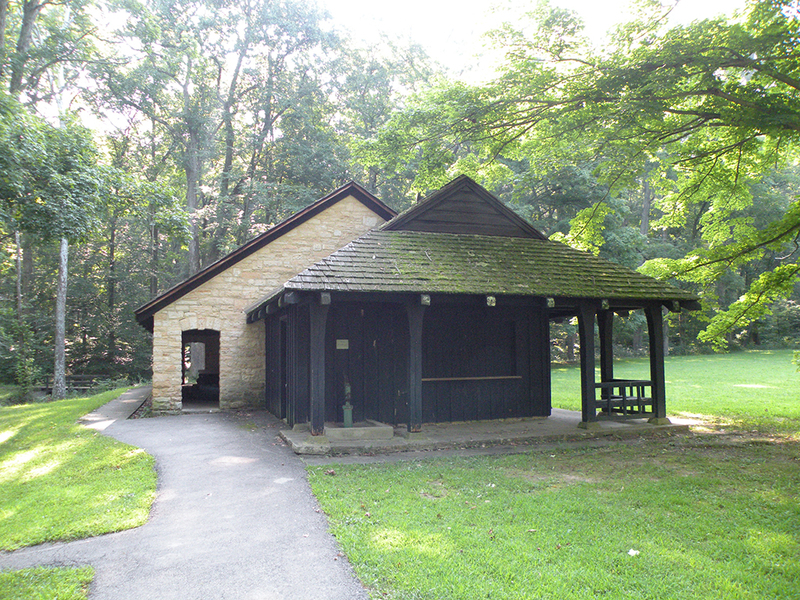 Fort Hill’s picnic shelter can be reserved for a fee of $40 per day. For reservations, please call ahead at 937-365-1935. There is no running water at the park, please bring your own water. Alcoholic beverages and recreational drugs are prohibited. Reservation grants exclusive use of shelter house only, park is open to the public. The Occupancy Limit of the shelter house is 80 people. No dumpster on site – please carry your trash out and leave the shelter house neat and tidy. Amplified music (speakers, sound systems, etc) is prohibited in order to grant a peaceful environment to the park. Acoustic music such as song or guitar playing is welcome. Groups must observe all park regulations, including no picking or collecting of plants, animals, and minerals, and no hunting or fishing. The park closes at sunset, groups must be packed up and ready to leave at that time. Thank you for observing these regulations – we have only a small staff and volunteers to run the park, so we count on your help!